Senate Majority Leader Mitch McConnell (R-Ky.), left, Judge Brett Kavanaugh and Vice President Mike Pence pose for photographs before a meeting in McConnell's office in the U.S. Capitol on July 10. Healthcare issues will be front and center during the upcoming Senate confirmation hearings for Brett Kavanaugh, President Donald Trump's nominee for a pivotal seat on the U.S. Supreme Court. A number of important healthcare cases could make their way to the high court in the coming years, and Kavanaugh's vote could swing those decisions. They include a new Republican challenge to the constitutionality of the Affordable Care Act; a patient lawsuit against Medicaid work requirements; challenges to the Trump administration's cuts of ACA risk-corridor, risk-adjustment, and cost-sharing reduction payments to insurers; and lawsuits by Medicaid patients seeking the right to see the provider of their choice. In addition, two Democratic state attorneys general plan to challenge the administration's new rule expanding association health plans that don't comply with ACA consumer protections. Patients and providers will also likely ask courts to enforce federal Medicaid access and payment standards in the states. Political observers say it would be smart for Democrats to focus their comments and questions to Kavanaugh on his legal views regarding the ACA's coverage expansions and protections for people with pre-existing medical conditions, which are popular with the public. Those features are directly at risk in the pending federal lawsuit in Texas brought by 20 Republican state attorneys general, which asks a federal judge to invalidate the ACA. Kavanaugh, who has served on the U.S. Court of Appeals for the District of Columbia Circuit since 2006, has written opinions and law review articles that offer hope and caution for the future of the ACA and Medicaid expansion. "I don't think he's a great friend of the ACA but I don't think he poses an existential threat," said Timothy Jost, an emeritus law professor at Washington and Lee University who supports the ACA. "Where I do see Kavanaugh making a huge difference is in cases involving the rights of poor people to sue to enforce the Medicaid statute." 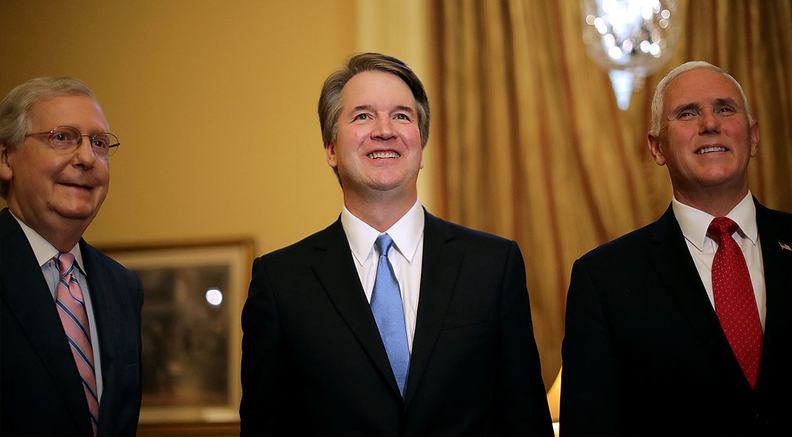 On the opposite side, Jonathan Adler, a law professor at Case Western Reserve University who led a legal challenge to the ACA, said Kavanaugh would take a tough approach to the Trump administration efforts to rush through sloppy executive changes to the law. "He's a tough grader in making sure federal agencies comply with the law," Adler said. "That's probably a mixed thing for the current administration that has large ambitions on this but doesn't always have people in place to do the heavy lifting." On the ACA, Kavanaugh concurred in a 2011 opinion tossing a constitutional challenge to the individual mandate on technical grounds. But in a dissent, he wrote that the ACA is "unprecedented" in U.S. history and warned that upholding it would be "a jarring prospect" that would "usher in a significant expansion of congressional authority with no obvious principled limit." Democrats warn that Kavanaugh's words bode ill for how he would vote as a Supreme Court justice if it considers the pending Texas v. Azar case in the future. The Trump administration has taken the side of 20 Republican attorneys general seeking to invalidate the law. The Democrats are playing up the potential effect of the litigation on access to affordable coverage for tens of millions of Americans who have pre-existing medical conditions. "The fact that Judge Kavanaugh went out of his way to talk about his fears about how broad the ACA may be ... tells you that if you have pre-existing conditions, you are in the crossfire right now," Sen. Chris Murphy (D-Conn.) said Tuesday. "This seat will potentially be the deciding vote as to whether Americans who have pre-existing conditions will continue to be able to get healthcare." But Adler doubts a Justice Kavanaugh would be sympathetic to the plaintiffs' claim in the Texas case that the entire ACA must be thrown out because Congress zeroed out the individual mandate penalty, an issue known as severability. He and many other legal experts see that argument as lame. "Judge Kavanaugh has a modest view of severability," Adler said. "I don't see anything in his record that's sympathetic to the plaintiffs' claim." One of the biggest questions about Kavanaugh is how much deference he would give the executive branch in making discretionary decisions about Medicaid and other healthcare programs, such as the administration's decision to let states impose work requirements on Medicaid beneficiaries. That issue could well come before the D.C. Circuit and then the Supreme Court following the June 29 ruling by a federal district judge in Washington, D.C., invalidating the CMS' approval of Kentucky's Medicaid waiver imposing a work requirement and other tough conditions for eligibility. Three other states have won approval for similar demonstrations, and many additional states want to do the same. It's projected that work requirements would lead to as many as 4 million low-income adults losing Medicaid coverage nationally. "We don't know very much about how Judge Kavanaugh will approach work requirements," said Abbe Gluck, a Yale University professor of health law who supports the ACA. "It's unclear to me how deferential he would be to the CMS. I could see him opening the door to more restrictions on Medicaid." Court challenges also are brewing against the Trump administration's rules allowing individuals and small businesses to buy leaner, cheaper coverage outside the ACA-regulated markets through association health plans and short-term plans. Those plans are expected to siphon off younger, healthier people, driving up premiums for older and sicker people who need more comprehensive ACA plans. Such lawsuits might argue that the administration's rules violate provisions of the ACA, citing a constitutional provision requiring the president to enforce the law. But Kavanaugh is known for being relatively deferential to presidential authority. Gluck has mixed feelings about Kavanaugh's nomination, calling him "a very reasonable judge on some issues." What bothers her is that Senate Majority Leader Mitch McConnell (R-Ky.) blocked President Barack Obama's nomination of Judge Merrick Garland in 2016 and created this opportunity for Republicans to cement a solid conservative majority for many years. "A court with Garland and Kavanaugh would be a good Supreme Court," she said. "But that's not the court we'll get, and that's what makes this moment extremely toxic."